Back in 1982, this album “Thriller” was released in November and has sold more of 65 million of copies worldwide (#1Best selling Album from all times) and winner of multiple grammys and awards. From the album, the single “Thriller” was released in January, 1984 with the most famous music video ever. From 5 minutes of song, the music video lasts 14 minutes. Ok, it’s not a video, it’s a short film. The video and song have influenced the media and culture for almost 30 years. I am not a MJ fan, but the song is awesome. 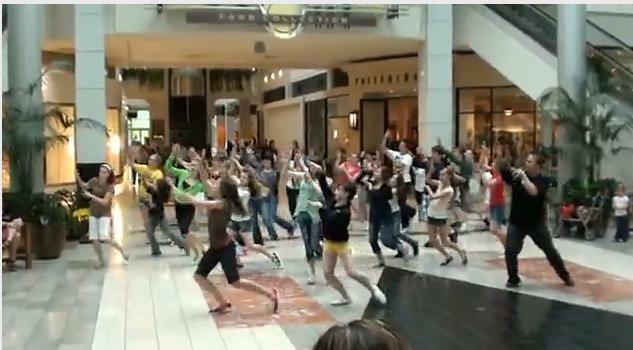 As a tribute to the song, a lot of videos for public quick performances known Flashmobs are all around Youtube. This is one I like.From the picture, the girls are around our 5th and 6th graders or maybe they are already on Secondary. On Jennifer Garner’s movie “13 GOING ON 30“, another tribute is made. In the movie, everybody danced this song because they grew up with it sooooo… they knew the choreography. My favorite show right now: Glee also made a tribute on their 2nd season. They performed a mash-up of Thriller and Heads will roll (the video is also a tribute to Thriller) by Yeah yeah yeahs. They dressed up as zombies and danced during half time of a very important football game. Youtube video here. If you have xbox, buy or rent the Michael Jackson the Experience video game and learn the dance.This girl recorded herself dancing with kinect. This person video looks cool too.